TSUM is one of Moscow's largest Department Stores located right inside the City Center within walking distance from Bolshoy Theater, the Red Square, History Museum, Ritz Carlton Hotel and other famous Moscow landmarks. 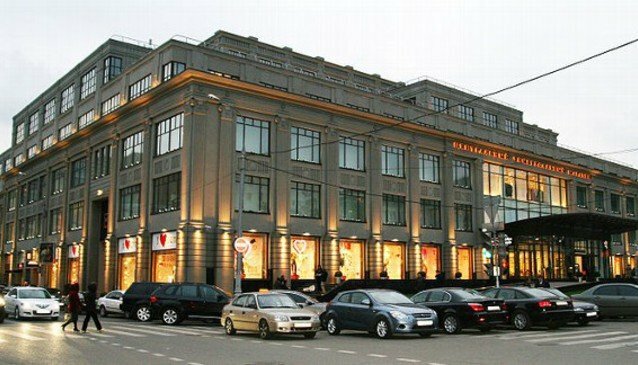 In terms of history, grandness, classic architectural design and popularity, it is the only other shopping mall in Moscow that can compare to the renowned GUM. Covering a floor area of 60,000 square meters, customers can choose from more than a thousand different clothing brands, cosmetics, shoes, accessories and perfumeries. In TSUM you will find world renowned designer brands like Gucci, Prada, Dolce & Gabbana, Bottega Veneta, Givenchy, Lanvin, Valentino, Roberto Cavalli, Yves Saint Laurent, Versace, Jimmy Choo, Alexander McQueen, Emilio Pucci, Marni and Balenciaga. There are also more commercial brands such as Blumarine, Calvin Klein, DKNY, Ferrari, Elie Tahari, Guess, Juicy Couture, Just Cavalli, Laundry, Loro Piana, Marc by Marc Jacobs, Malo, Patrizia Pepe and Strenesse amongst many others. On TSUM's second floor the services of stylists are available and bespoke cosmetic cabins offer cosmetic procedures by popular cosmetic brands. A restaurant and a cigar room are also found on this floor, while the TSUM Cafe is found on the fourth floor. On the ground floor of TSUM there is a twenty-four hour luxury supermarket, the 'TSUM Globus Gourmet'. A number of exclusive and original bars are available here - the literally very cool Ice Vodka Kauffman Bar (the only ice bar in Moscow), the Oyster Moet & Chandon Bar (with exotic fresh fish including oysters and sushi), the Blynny Bar decorated in the style of the Russian Tsar's ancient palace (serving traditional Russian snacks and 'blyny' (pancakes) and selling Russian souvenirs) and finally the chic Henessy Cognac Bar. A large modern underground car park is available at the TSUM Department Store.